For other people with the same name, see John Gill (disambiguation). 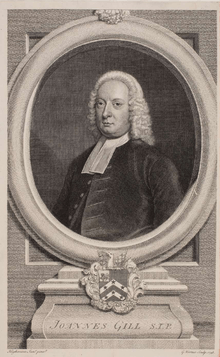 John Gill (23 November 1697 – 14 October 1771) was an English Baptist pastor, biblical scholar, and theologian who held to a firm Calvinistic soteriology. Born in Kettering, Northamptonshire, he attended Kettering Grammar School where he mastered the Latin classics and learned Greek by age 11. He continued self-study in everything from logic to Hebrew, his love for the latter remaining throughout his life. At the age of about 12, Gill heard a sermon from his pastor, William Wallis, on the text, "And the LORD God called unto Adam, and said unto him, Where art thou?" (Genesis 3:9). The message stayed with Gill and eventually led to his conversion. It was not until seven years later that he made a public profession when he was 18. His first pastoral work was as an intern assisting John Davis at Higham Ferrers in 1718 at age 21. He became pastor at the Strict Baptist church at Goat Yard Chapel, Horsleydown, Southwark in 1719. His pastorate lasted 51 years. In 1757 his congregation needed larger premises and moved to a Carter Lane, St. Olave’s Street, Southwark. This Baptist church was once pastored by Benjamin Keach and would later become the New Park Street Chapel and then the Metropolitan Tabernacle pastored by Charles Spurgeon. During Gill's ministry the church strongly supported the preaching of George Whitefield at nearby Kennington Common. A Body of Practical Divinity (1770). Gill also edited and re-published the works of Rev. Tobias Crisp, D.D. (1600-1643). John Gill was the first major writing Baptist theologian, his work retaining influence into the 21st century. Gill's relationship with hyper-Calvinism in English Baptist life is a matter of debate. Peter Toon has argued that Gill was himself a hyper-Calvinist, which would make Gill the father of Baptist hyper-Calvinism. Tom Nettles has argued that Gill was not a hyper-Calvinist himself. ↑ John Gill, "A Dissertation Concerning the Antiquity of the Hebrew Language, Letters, Vowel-Points and Accents", Vol. 3, p. 429. Daniel, Curt. Hyper-Calvinism and John Gill. Unpublished Ph.D. dissertation, University of Edinburgh, 1983. Ella, George (1995). John Gill and the Cause of God and Truth. Eggleston, England: Go-Publications. Peter Toon, The Emergence of Hyper-Calvinism in English Nonconformity, 1689-1765. London: The Olive Tree, 1967. This article incorporates text from a publication now in the public domain: Jackson, Samuel Macauley, ed. (1914). "John Gill". New Schaff–Herzog Encyclopedia of Religious Knowledge. IV (third ed.). London and New York: Funk and Wagnalls. p. 489. Wikimedia Commons has media related to John Gill (theologician).